He has to-do lists scattered around the kitchen. Buy stakes for tomato plants. Fix headlight. Bleach cat boxes. Lists for each day of the week, a master list for the entire summer break. I find them in the morning next to notes left for me, written the night before, telling me to have the best day ever and that my Murdos love me. He goes grocery shopping. He sends me pictures of our boy behaving so sweetly in the cart. He texts, "Do you want cheddar brats or regular brats? Do you want tots?" I answer: "Regular. And yes!" He puts the boy down for a nap so that he's sleeping when I get home from work. He goes outside to start grilling while I change, slice onions, preheat the oven for tots, take pictures of our blooming clematis in the backyard. The boy wakes up and I feed him while Murdo finishes making dinner. We're having brats and tots, with charred mustardy onions. They're delicious. We watch Orange is the New Black while we eat, the boy in his bouncy chair by my feet, playing and smiling happily before finally dozing off. After dinner, I want to hold my baby. I want to feel his warmth and cuddle and kiss him. I realize I've hardly held him all day besides when feeding him. I think about the tiny newborn shirt I found the other day mixed in with the laundry -- a memory of how small he used to be, how big he's getting and how fast. Has it really already been 4 months since he was born? Was there really a time when he was small enough to fit into those tiny clothes, when he couldn't hold his head up, when he passed out on my chest after every feeding, when he ate every two hours around the clock? A part of me (a big part) is glad that we're past that. Another part is sad. So I pick him up from his seat, lean back, and place him on his tummy on my chest. He lifts his head (so strong!) and props himself up on his arms, his eyebrows raised and eyes wide with curiosity, his mouth open and ready to smile. His daddy slides over on the couch so that he's next to us and smiles. Little M smiles big right back. They are smiling, and laughing, and talking. I hold M on my chest and soak it all in. This is everything. To Murdo, my husband: Happy Father's Day. And thank you. Thank you for moments likes these. For taking such good care of our son, for loving him so much, for texting me pictures and videos throughout the day because you know how it feels to miss him while at work, even after just a few hours away. For making him laugh the way you do. For going grocery shopping during the week because I can't find the time on the weekend. For cooking dinner. For putting up with me when I get crazy and cranky. 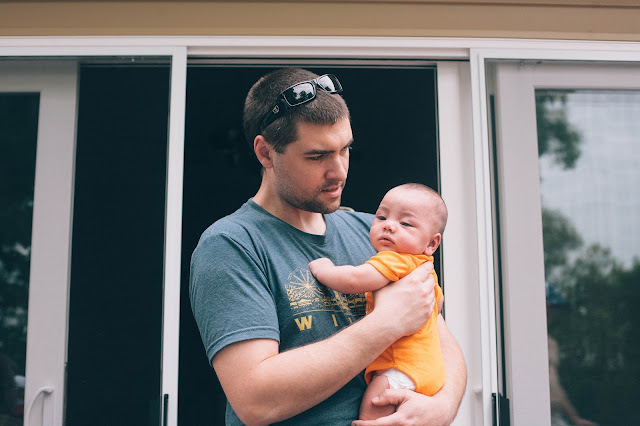 For those first 10 days in the NICU -- thank you for being strong, and for asking the doctors all the right questions, and for diving headfirst into fatherhood with no fear, and all the confidence in the world, like you do with everything. For those first couple months when M was just a tiny newborn and I couldn't do simple things like dress myself, and you were taking care of all of us, constantly washing pump parts and keeping track of my medications and getting me water and paying hospital bills and feeding the cats and making sure the house didn't crumble around us. For being the best father from the very beginning, from the moment he was born, when you said to me in disbelief, "He's here. He's here!" For every moment since, and every moment still to come. Oh geez. All the tears over here. Beautiful. I know this is a Father's Day post, but while I was reading this I was reminded of my own Charlie Newborn days and the same thoughts and feelings you are having with work and babies growing and the thrill of soft bodies in tired, loving arms. And all I could think was, I'm so glad you're a mother now, Jacqui, and I'm so glad you can feel these wonderful, beautiful moments too. I love him more every day! He's so much fun! There is nothing better + more heartwarming in this world than watching your husband with your child, right!? !